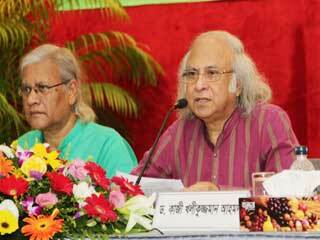 Palli Karma-Sahayak Foundation (PKSF) organized a seminar on “The elderly people of Bangladesh: challenges and actions for enhancing their quality of lives” at PKSF Auditorium, Agargaon, Dhaka on 02 June 2015. Eminent economist and Chairman of PKSF Dr. Qazi Kholiquzzaman Ahmad presided over the seminar. Mr. Md. Abdul Karim, Managing Director, PKSF, Mr. Md. 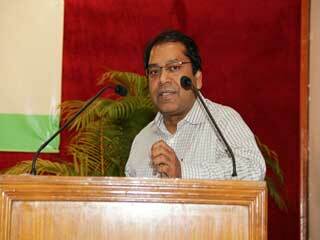 Fazlul Kader, Deputy Managing Director, PKSF shared PKSF’s thinking for the elderly people with the audiences. Professor A.K.M. Nurun Nabi, Vice-Chancellor of Begum Rokeya University and member, Governing Body of PKSF, Dr. Bazlul Huque Khandaker, Professor of Economics Department, University of Dhaka, Mr. Abul Haseeb Khan, Director, Resource Integration Center (RIC), Mr. Mohammad Iqbal Hossain, Senior Policy Officer, HelpAge International and Ms. Salome A. Rahim, Nursing superintendent, TMSS Medical College presented five different articles in the seminar. Mr. Md. 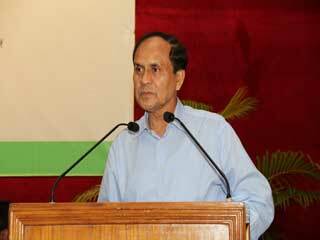 Fazlul Kader, in his welcome speech, said that PKSF has been adding up new dimensions to its activities through an evolutionary process. In continuation to this PKSF has decided to add a new feather in its cap by starting an explicit program for the elderly people. He said that various problems or complications at the end of life of the elders emerge like black clouds and we may not be able to remove all of these. But PKSF, according to its means and ability, will try to fulfill as much of its commitment. He urged the Partner Organizations (POs) to play the catalytic role in the implementation of the program through taking firm decision in this regard. Mr. Kader thanked Dr. Qazi Kholiquzzaman Ahmad for inspiring PKSF to diversify its interventions in order to address poverty in an integrated way. Mr. Md. Abdul Karim portrayed a brief picture of the initiatives that PKSF is going to take in future for sustainable welfare of the elderly people. He informed that the already established ENRICH centers for the elderly people in 43 Unions are getting huge acclamation and PKSF has decided to expand these centers where the elders will be able to sit and discuss together, read magazine, watch TV and can also play. Mr. Karim also talked about introducing primary health care system, senior-friendly and flexible loan, suitable training, Physiotherapy service at affordable cost, counseling centers, funeral arrangements, etc. He said that there are also some necessities such as establishing geriatric institute, which are beyond PKSFs scope, but PKSF surely will request the respective department or authority of the government to take required actions. Mr. Karim shared PKSF’s plan to reward elders who have contributed greatly to the country for poverty alleviation and social development. At the same time PKSF will also award the oldest elderly people as the senior citizen. Professor A.K.M. 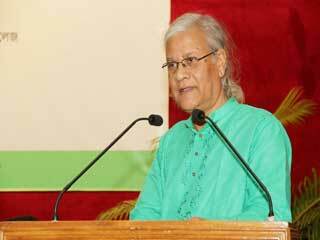 Nurun Nabi, in his directional speech, mentioned that according to recent studies demographic dividend in Bangladesh will end in 2031 meaning the percentage of older people will start increasing after that and will put pressure on the economy. 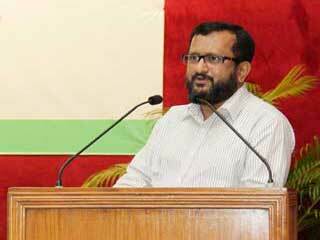 Dr. Nabi said, it is high time to create an action-framework for the elders. 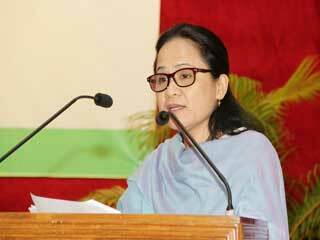 He insisted on taking specific programs under an institutional framework to ensure the welfare of the elderly people. 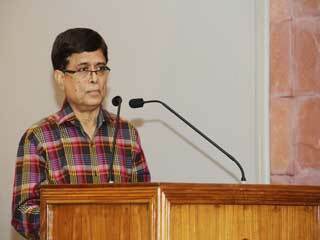 Dr. Nabi recommended engaging elderly people as advisors in grass root level development project activities, introducing a priori deduction system from wages at earlier ages as a forced savings for old age allowance, social security with medicare and establishing Community Ageing Deposit Scheme for younger persons to provide care for elderly to get care in return at their old age. Dr. Bazlul Huque Khandaker has shed light on the possible significant positive change of the country’s economy that can be achieved by increasing budget allocation and investing in social security for the elderly people. Referring to one of his research assessing the macro-economic impacts of Universal Pension scheme with Investment projectDr. Khandaker said that transfer payments (such as pension) has similar or sometimes even more impact on economic growth compared to any infrastructure investment. He advised for introducing subsidized credit, transportation and entertainment facilities for the senior citizens along with enhanced coverage and transfer amount of the Old Age Allowance. Mr. Abul Haseeb Khan shared his speech in the light of thinking of the development agencies and experiences of their programs conducted for the elderly people. Mr. Khan advocated for choosing Active ageing approach that deals with ensuring participation, health and safety to improve the quality of life of elderly people. Mr. Khan advised for establishing informal institute for the elderly people in villages and towns, arranging Inter-generational dialogue and involving them in social arbitrations and other such mechanisms. Mr. Mohammad Iqbal Hossain discussed on “Reflections of development agencies and various programs for the elders in the international arena”. 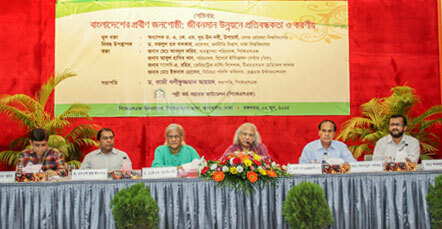 A paper on “The Need for Geriatric Nursing in the Coming Years in Bangladesh” was presented by Ms. Salome A. Rahim. She spoke on the common health problems of the elderly people and expansion of geriatric nursing education. Among the invitees, two senior citizens from the members of PKSF’s POs also shared their practical life experiences with the audiences. D r. Qazi Kholiquzzaman Ahmad said in the closing remarks that the most important thing for the elderly people is to provide emotional support. He said the family members are in the first place to take this responsibility and if they fail then the institutions should take the responsibility. He emphasized on looking at the elderly people not as a client, but as a man and serving them in a way so that it does not hurt their self-esteem. He shared that all PKSF activities are designed by putting people in the centre and upholding the human dignity. Dr. Ahmad said that PKSF has been furnishing its poverty alleviation programs by taking into consideration of all multi-dimensional aspects of a person’s entire life at all its different stages. He also urged the POs to work for elderly people and spread this as a social movement. He assured them that PKSF with its limited resources will continue its assistance to the partner organizations. “PKSF cannot solve all problems within today or tomorrow, but we can at least pave the way for the future to smoothen the way forward for the next generation”- Dr. Ahmad said. Representatives from different organizations of elderly people, Officials from Partner Organizations (POs) of PKSF, Electronic and Print Media representatives and PKSF officials participated in the seminar.